Fitness-4-U are able to provide personal trainers across the Swindon, Wiltshire, Gloucestershire, West Berkshire and West Oxon areas. Fitness-4-U Trainers run sessions in your own home, garden, office or local park. We can fit in a session around your busy schedule, whether you want to exercise early morning before work, lunchtime or last thing at night. Having been a competitive club/county runner since I was 14 (latterly with Swindon Harriers), I have been used to training almost every day for the last 25 years with a mix of aerobic, gym, circuit and resistance training. Previously Personal Trainer with Fitness First, Swindon. 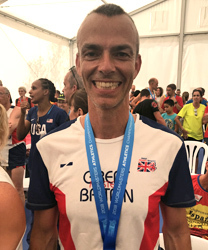 I have competed on the track, cross country and road over distances ranging from 800m to the Marathon and represented both the GB and England Masters Athletics teams over 10km and Half Marathons. I am enthusiastic, totally reliable, and possess a high level of motivation. I consider my main strengths to be my positive attitude, approachability, helpfulness and adaptability and my easy-going personality enables me to get along with people from all walks of life. I have been a personal trainer for sixteen years. B.A Honours degree (2:1) in Sport and Recreation Studies.